Would Americans Put Up With This ? Cliff May at Townhall.com posted an article today about Sderot, a town in Israel that has been under fire from Hamas for thirteen years. 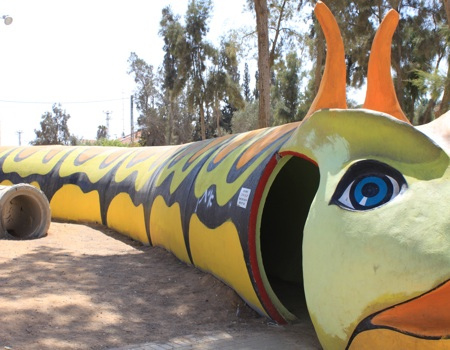 This is a bomb shelter in a playground at Sderot. The people of Sderot have been under intermittent attack for 13 years. More than 15,000 rockets have been fired from Gaza at Israeli targets – 12,000 of those since Israel withdrew from the territory in September 2005. Those Israelis who believed that giving up all claims to Gaza would bring peace — or at least contribute to the “peace process” — have been proven wrong. Israelis are often advised by foreign friends not to “over-react” to the missile attacks. Imagine if Vancouver were lobbing missiles into Seattle. How might Russians respond if Poles were shooting rockets at Moscow suburbs? More than twenty types of missiles have been identified. Hamas colors its missile red and green, which gives them an almost Christmassy look. The plain red ones are courtesy of Palestinian Islamic Jihad. Yellow and red indicate the Al Aksa Martyrs’ Brigades. The black ones are from al Qaeda which also maintains a presence in Gaza. These weapons are often called Qassams but that’s a generic name that can refer to any improvised missile. If Sderot were El Paso, Texas, and rockets were coming from Mexico, how long would we put up with this? The ongoing rocket attacks in Sderot are a fact of life. That fact needs to be part of the equation when we deal with Israel and the so-called peace process. If the Palestinians truly wanted peace, would the rockets be flying? This story is based on two articles–one posted by Paul Mirengoff at Power Line today and one posted at the Los Angeles Times today. Both articles were reporting on the Senate confirmation hearings of former Senator Chuck Hagel. The headline on the Los Angeles Times article is “Chuck Hagel, an antiwar secretary of Defense.” That is an interesting statement. First, Cruz (Senator Ted Cruz) played excerpts from a tape of Hagel’s 2009 appearance on al Jazeera, in which a caller suggested that Israel had committed war crimes. In responding to the question, Hagel did not dispute the caller’s statement. Cruz also pointed to statement by Hagel that Israel had engaged in “the sickening slaughter” of Hezbollah, which sounds a bit like war crimes. The American friendship with Israel goes back to 1948 when Israel became a nation. To accuse Israel of slaughter when Hezbollah routinely lobs rockets into civilian Israeli population centers is simply not factual. Senator Hagel may represent the President’s views on Israel, but those views are not good for either America or Israel. Next, Cruz played an excerpt from the same interview in which the al Jazeera host read a reader e-mail claiming that the United States has served as the world’s bully. This time Hagel not only failed to take exception and stick up for his country, he said on al Jazeera he found some merit in the claim, calling it “a good observation” (the Washington Post report linked to above fails to report this fact). To me, this is the problem with the nomination. Traditionally America has acted as a policeman in the world–coming to the aid of people when democracy was in danger. We have not played that role under President Obama–we have supported a revolution in Egypt that has led to a government that is anything but democratic and we refused to help the green revolution in Iran. I suspect Senator Hagel will be confirmed. Unless there is some major scandal associated with a President’s cabinet nominee, I believe the candidate should be confirmed. Elections have consequences. President Obama was legally elected. Unfortunately, I think the cabinet appointments of Senator Kerry as Secretary of State and Senator Hagel as Secretary of Defense will hurt America in the long run. Yesterday the Washington Post reported on the Israeli air strike inside Syria. The strike was apparently aimed at a new SA-17 antiaircraft missile battery the Syrians had placed northwest of Damascus. The Israeli attack on the SA-17 missiles was first reported Wednesday by the Associated Press. What’s intriguing is that the same area that was hit — the Jamraya research center in the suburb known as Dummar, northwest of Damascus — is also a center for chemical weapons research. This led some Syrian opposition sources to believe that the Israelis’ real target was the chemical weapons center. …The real significance of Wednesday’s attack, to me, is that the Israelis have laid down a marker. This is the first time their jets are known to have staged combat operations inside Syria since a 2007 raid on a nuclear reactor, a preemptive strike which to this day Israel officially refuses to confirm. The Israelis have now shown that they are prepared to strike if they see evidence of weapons that might threaten them — such as the advanced SA-17 missiles or, down the road, chemical weapons that are on the move. Israel just made every country in the area a little bit safer. There is no telling what will happen to Syria’s chemical weapons when the current regime fails. Hopefully the Israeli strike has made them less useful. This article is based on a story posted yesterday in the New York Times. I will admit that my reaction to the story is totally biased. I am the proud owner of two shelter cats. I fostered shelter cats for about a year and a half before I adopted these two. 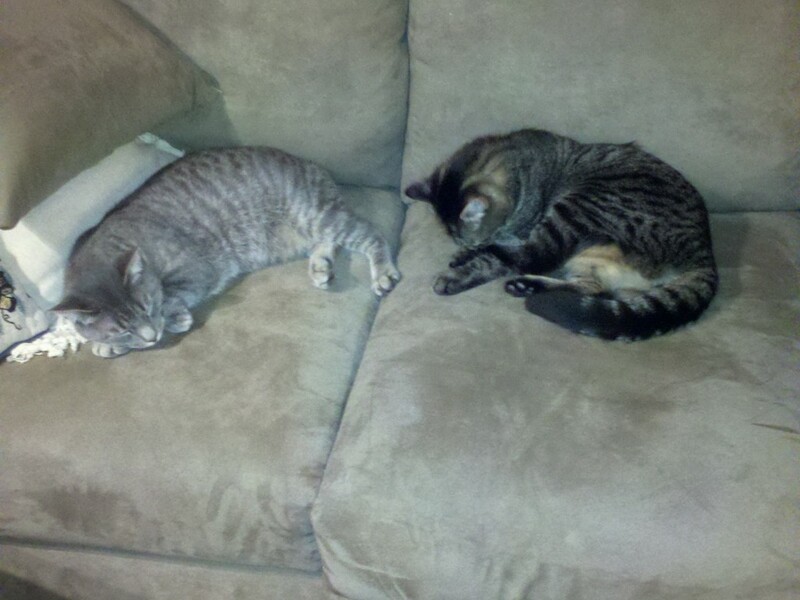 I also need to mention that my cats are strictly indoor cats. The shelter I worked with was a no-kill shelter that had a TNR (trap-neuter-return) program. Cats do kill birds and mice and other animals. It’s what they do. The problem here is not the cats–it’s the irresponsibility of the people who abandon them. The feral colonies will die out because of the TNR program. Looking into the future, I see myself needing cat licenses for my pets. I truly think this is ridiculous. Just a note. As I stated, I have two indoor cats. Since they were rescued, they have not been outside or expressed any desire to be outside (they are a little more than a year old). However, the average lifespan of a field mouse that manages to get into my house is about 5 seconds. Hunting is a feline instinct, and cats should not be condemned for it! On Monday Reuters reported that a large weapons shipment was intercepted off Yemen. The shipment was from Iran and contained weapons for Yemeni insurgents. The shipment included surface-to-air missiles. It should be mentioned that surface-to-air missiles were the deciding factor in the war Afghanistan fought against the Russians–when America supplied the shoulder held weapons, the mujahideen began shooting down the Russian airplanes and eventually kicked the Russians out of the country. Yemen’s government said in a statement the shipment was intercepted in Yemeni waters, close to the Arabian Sea. It said Yemeni Coast Guard officials boarded the vessel, which flew multiple flags and had eight Yemeni crew members on board. “Authorities are continuing to investigate the vessel’s shipping route by analyzing navigation records found on board the ship,” the statement said. Yemen is dealing with Al Qaeda in the north and insurgents sponsored by Iran in other areas. This is another instance where Iran is trying to increase Shi’ite influence where Sunni Muslims are in charge. Iran is not only a danger to Israel, it is a danger to all the Sunni Muslim countries in the area. It would not be a surprise to see some of those Sunni countries support Israel as it seeks to slow Iran’s progress in developing a nuclear bomb. It is also important to remember that one of the main supporters of Iranian nuclear activity is Russia. They are supplying technology, hardware and scientists,. Notice that she does not mention a planned attack in her list. The problem is not actually the motive behind the attack–the problem is that the Obama Administration lied about the motive even after it became obvious that they were lying. The war on terror will continue whether or not we choose to fight it. Those who wish to do America harm will continue to train and arm themselves for the fight whether we are fighting or not. The Daily Caller is reporting today that the United States Court of Appeals for the District of Columbia has ruled that the Environmental Protection Agency cannot force refiners to use cellulosic biofuels, which aren’t commercially available. The court sided with the country’s chief oil and gas lobby, the American Petroleum Institute, in striking down the 2012 EPA mandate that would have forced refineries to purchase more than $8 million in credits for 8.65 million of gallons of the cellulosic biofuel. However, none of the biofuel is commercially available. The decision applies to the cellulosic biofuel which is currently not commercially available–it does not apply to EPA regulations regarding other renewable fuels, like ethanol and biodiesel. Reza Kahlili (google him if you don’t know his story!) posted an article at World Net Daily today about an explosion deep within Iran’s Fordow nuclear facility. The regime’s uranium enrichment process takes place at two known sites: the Natanz facility with more than 10,000 centrifuges and Fordow with more than 2,700. The regime currently has enough low-grade (3.5 percent) uranium stockpiled for six nuclear bombs if further enriched. Israel has been working quietly (and sometimes not so quietly) to sabotage Iran’s nuclear program, so it is quite possible they might have some connection to this explosion. In the past, Israel and America worked on the Stuxnet computer virus, but since President Obama bragged about being part of that program, I suspect there has been less cooperation between the two countries. It’s going to be interesting to see if anyone takes credit for causing this explosion. If This Decision Stands, What Happens Next ? The Daily Caller (along with many other news sources) is reporting today that the United States Court of Appeals for the District of Columbia Circuit has ruled that President Obama’s appointments to the National Labor Relations Board made during the time that the President declared that the Senate was in recess are unconstitutional. The President does not have the power to declare whether or not the Senate is in recess–that is up to the Senate. The Jan. 25 ruling came after Republican senators filed a case arguing that Obama did not have the power to appoint top-level officials via a “recess appointment” if the Senate says it is in session. Obama made that claim when he announced the appointment of two people to the National Labor Relations Board in January 2012. The appointments allowed the board to subsequently issue a series of pro-labor, anti-business decisions. Following the court’s ruling, the board’s decisions are now vulnerable to a series of lawsuits. Obama used the same claim to appoint Democratic lawyer Richard Cordray to head the new Consumer Financial Protection Bureau in January 2012. …three appointments to the five-member NLRB by President Obama made on January 4, 2012, under the Constitution’s Recess Appointments Clause (Article II, Section 2, Clause 3), were not valid because the Senate was not in recess at the time the appointments were announced. There have been a number of rulings by the NLRB and the Consumer Financial Protection Bureau since these recess appointments. Theoretically all those actions will be nullified because the people making the decisions were not legally entitled to make them. The specific case that was ruled on was Noel Canning v. National Labor Relations Board. I am sure that we have not heard the end of this. The statement “There are no atheists in foxholes” came out of World War II. Its origin is uncertain–it is sometimes credited to U. S. Military Chaplain William T. Cummings during the Battle of Bataan and sometimes credited to Ernie Pyle. That information is from Wikipedia, so keep that in mind. At any rate, it seems that at the present time Christians may not be allowed in foxholes. Fox News reported yesterday that the Christian symbols have been removed from the chapel at Forward Operating Base Orgun-E in Afghanistan. I thought religious freedom was one of the things our military was defending. The military takes an oath to defend the U. S. Constitution which supports freedom of religion. I am sorry if a soldier was offended by the cross, but the Constitution does not tell him that he has the right not to be offended. Is he also offended by the Star of David or the Crescent Moon? Guess what? I really don’t care. Christianity is a part of the heritage of our country and of our military. There is no reason to strip our bases of that heritage. This is not a good path for America to be traveling. It doesn’t take a genius to predict that the Obama Administration will shut down fracking (hydraulic fracturing) on government land and attempt to shut down fracking on private land sometime in the next few months. However, in the meantime the increase in fracking in the United States has had unexpected consequences around the world. Yesterday the Washington Times reported that other countries are attempting to copy the process of fracking to produce shale gas. …More than 100 exploration concessions to more than two dozen companies have been awarded, and the Polish State Geological Institute estimates that the country’s shale gas deposits may secure domestic production for at least 25 years. Britain has lifted a moratorium on fracking that was imposed after a previous operation was blamed for sparking an earth tremor. Argentina, the largest producer of natural gas in South America, is eyeing the practice on a significant scale to better exploit its supply. Needless to say, the environmentalists do not approve. Think about that for a minute. Fracking provides a path to energy independence for a number of nations around the world. It reduces worldwide dependence on Arab oil and the funding of terrorism. There is no proof that fracking harms the environment; in fact, studies so far have shown that it does not. Cheaper energy provides prosperity for more people and freedom for more people. Why would the environmentalists object to that? Maybe it’s time to examine the agenda behind their agenda. Some already are warning that Europe may miss out on a global energy revolution if the green forces on the Continent prevail. As in the U.S., Mr. Medlock said, it comes down to “political geography” more than anything else. A ban on fracking in Vermont was relatively easy to achieve because the state is thought to have little in the way of recoverable natural gas. The same holds true in a country such as France, Mr. Medlock said. For Poland and others, where fracking likely will lead to tangible energy benefits, critics will continue to have a tougher time mounting serious opposition. This is going to be an interesting fight between those who want freedom and prosperity wherever possible and those who want only control of the population. Given my time spent as an AH-1W pilot in the Marine Corps, my phone, email, Facebook, twitter, etc has been bombarded with questions about how I feel about this. So rather than answer everyone individually, below, I wrap up all question and give my response. First, a disclaimer. I am no longer in the Marine Corps. The views, idea, feeling, rants, offensive comments, off color remarks, or general pissyness are mine and mine alone. They do not reflect the the views of the Corps, or University of Denver. So, with that aside, here I go. Historically, the central question of the women in combat debate has been “are women physically capable of performing the duties required for combat?” This question is quickly and easily answered. Objectively, women are increasingly proving themselves as physically capable as men. In both endurance events and tests of strength-to-weight, women are evening the playing field and living up to what has been thought of as “mens standards.” Women have also proven themselves tactically as capable as men in all objectively measurable fields. If these objective standards – how fast one can run, how much one can lift, how well one can shoot – were the only indicators of success in combat there would be no argument or debate; those meeting the standard would be inarguably successful. However, success in combat units is determined by more than just objective abilities, and thus the debate deepens. It is universally accepted that the safety and success of our military units is paramount. It is for this reason that I believe the debate needs to shift away from “are women capable” of serving to “are women a value added”. This changes the argument from “can or cannot” to “should or should not”; a question that needs to be addressed top-down rather than bottom-up. Throughout the last decade-plus of the United States’ involvement in the conflicts encompassing the Global War on Terror, there is no arguing that women have found themselves “in combat situations.” In these situations, women have shown valor, strength, leadership, fortitude, and upheld the values of honor, courage and commitment. Many have given the ultimate sacrifice, and each and every one of them deserves a place in history and our hearts as a true hero. But being “in combat situations” is not the same as being a “combatant.” Combatants are offensive. Their mission is to close with and destroy the enemy. They seek engagement. Their primary purpose is to assert superiority over an enemy force. Having the technical and tactical skill to react properly when coming under fire during the performance of primary duties – whether it be an ambushed logistics patrol, FET team patrol, or MP checkpoint attack – provides a foundation of knowledge and experience necessary for the argument supporting a woman’s ability to be in combat. However, mastery of this baseline alone does not necessarily equate to success of a woman in the role of a combatant. Successful combat units are a product of the intangible – the fabled esprit de corps – as much as technical and tactical proficiency. This elusive intangible cannot be “trained in” to a recruit. It cannot be taught in infantry school. No amount of extra pushups, remedial weapons training or nights in the field ensure that it exists. Women are just as capable as men of developing the necessary esprit de corps. But it cannot be forced. I hope that in implementing these changes, no arbitrary timelines are put in place. If it takes 2 weeks, 2 months, 2 years or 2 decades for the right women to come into combat roles, so be it. The US military is an all-volunteer force, and to respect that tradition, combat roles must be volunteer. Quota systems will only set the work of every woman who has served back, by making light of the sacrifices involved in paving the paths they did. I have the upmost trust that the DoD will set standards appropriately. And I sincerely hope that the civilian oversight and general population will let this change grow organically and fruitfully, while respecting the grave responsibility for life given to each member of the US military. I can say from experience that the road for these women will not be easy. I have chronicled much of my coming to grips with what my experience and service mean. But I know that I, and all my sisters in arms, are more than capable to serve in all roles necessary for defense of this great nation. Yet it will not be easy. And hopefully the public will understand that in such a situation we all must be patient for the women who should emerge to lead our sons and daughters in arms, and not force them in their time. Ky, thank you for your service, and thank you for your words of wisdom. An Intentional Lie Or A Lack Of Knowledge ? Fox News posted a story today about one aspect of Secretary of State Clinton’s testimony before Congress yesterday. I am sure there will be many stories about her testimony to come, but there was one aspect that was very telling. As I listened to Secretary Clinton, it became very obvious that although she ‘accepted responsibility’ for the deaths at Benghazi, she placed part of the blame for the attack on budget cuts–indirectly blaming Republicans because Democrats only do budget cuts in the defense budget. When you examine the State Department budget numbers for the past several years, blaming budget cuts does not hold water. Budget numbers, though, show the overall diplomatic security budget has ballooned over the past decade. While there were modest decreases in funding in recent years — and Congress has approved less than was requested — the overall security budget has more than doubled since fiscal 2004. For that year, the budget was $640 million. It steadily climbed to $1.6 billion in fiscal 2010. It dipped to $1.5 billion the following year and roughly $1.35 billion in fiscal 2012. Slightly more has been requested for fiscal 2013. It’s difficult to tell how much was specifically allocated for Benghazi. Tripoli was the only post mentioned in the department’s fiscal 2013 request — funding for that location did slip, from $11.5 million in fiscal 2011 to $10.1 million the following year. Slightly more has been requested for fiscal 2013. Ignoring requests for increased security is not a budget issue. If the money was not available to protect our ambassador and staff at Benghazi, the ambassador and staff should have been moved elsewhere. The other part of this story that seems to be ignored is the report that Tyrone Woods and Glen Doherty. were asked to stand down rather than help. I am sure there will be more questions as Secretary Clinton’s testimony is analyzed. What I am not sure of is whether the picture of what actually happened at Benghazi will become any clearer. Yes, I realize that what I am about to report does not have to do with the Jurassic Era–it has to do with the movie. Fox News reported yesterday that Professor George Church, a professor of genetics at Harvard’s Medical School, wants to bring Neanderthal man back to life. He is looking for an ‘adventurous woman’ to help him in his quest. Last year, researchers finished sequencing the genome of another extinct human relative, the denisovan — based solely off a piece of fingerbone and two molars. I guess I am hopelessly old fashioned, but I really would prefer that Neanderthal man continue to rest in peace. 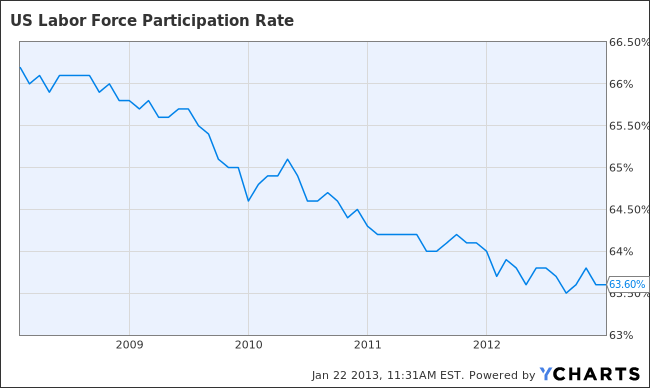 The chart above shows what has happened to the labor force in America since 2009. These are the worst labor participation rates since 1978, Unless Washington begins to get its fiscal house in order, these numbers will become the new normal for Americans.